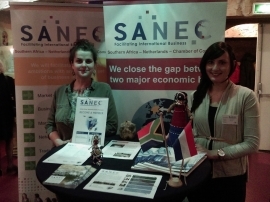 On the 13th of April 2017, the Dutch Chamber of Commerce (KvK) organised, in collaboration with SANEC, BIZ, BDE and NABC a seminar on doing business in Africa. The "Road2Africa" Seminar provided valuable insight on various African Countries. The event placed a particular emphasis on (export) opportunities in Africa for Small and Medium-sized companies. The plenary part of the event delved into the importance of Corporate Social Responsibility (CSR) whilst doing business in Africa. The event also focussed on financial aspects, with topics such as supporting exports and investments in Africa, and how financial risks in transactions can be avoided. The seminar was hosted by Safaripark Beekse Bergen in Amsterdam. More than 80 participants were present on the day. The day consisted of a series of roundtables with a focus on Kenya, Nigeria, Rwanda and South Africa. These rountables featured country experts and entrepreneurs with practical knowledge of doing business in these countries with whom the attendees were able to engage in dialogue. SANEC organised the South Africa Roundtable, of which we were able to provide insightful information on the country's opportunities. After the Rountable Sessions, the event was followed by a lively and well attended network reception with bites and drinks. SANEC is grateful to KvK for giving us the opportunity to host the South Africa Rountable. We would like to thank all our participants who made this event a great success!